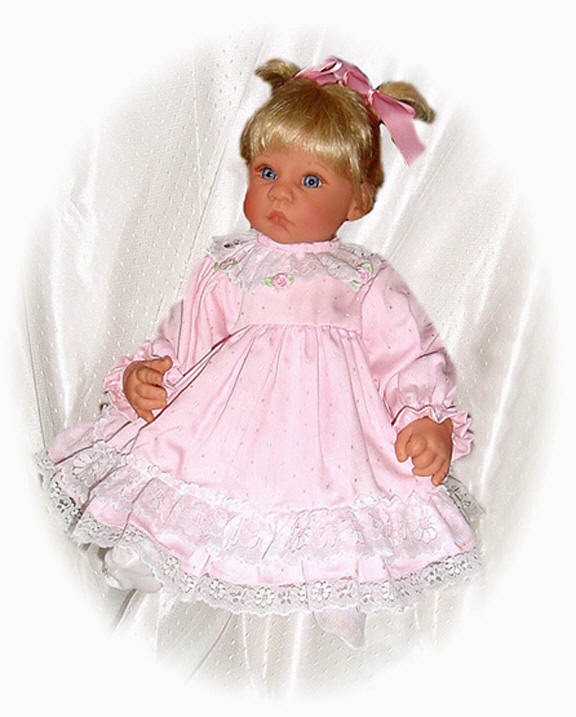 Baby Doll Clothes, Shoes, Baby Doll Dresses For Lee Middleton Dolls and More At Sew Dolling! 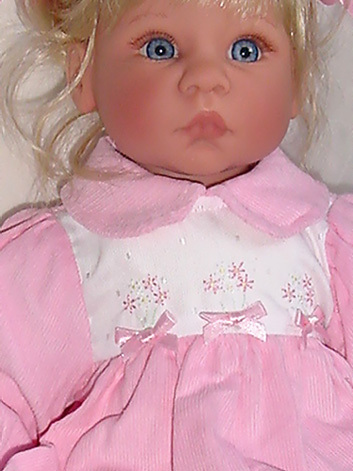 See how easy it is to order doll clothes online or by mail from Sew Dolling! 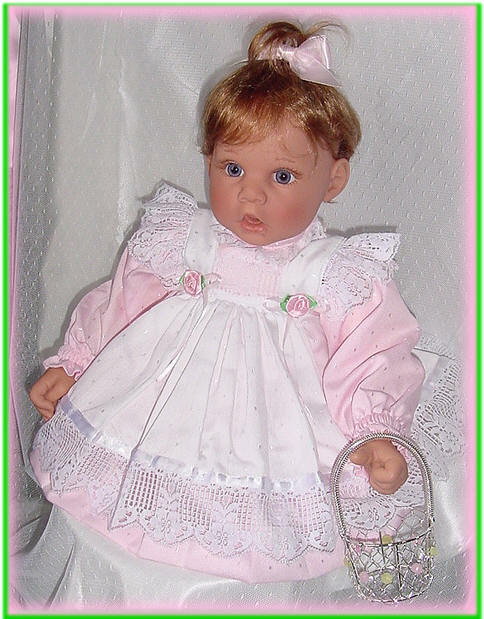 Find gorgeous baby doll clothes! 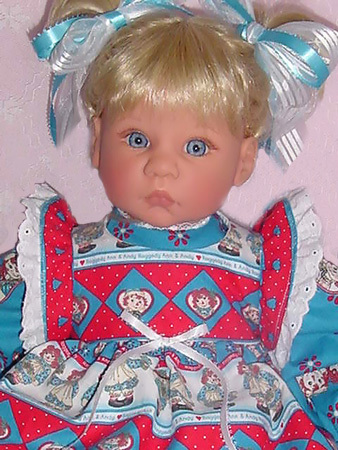 Discover beautiful baby doll dresses and outfits for your 19-22" friends and Lee Middleton® dolls: dresses, pinafores and clothes in lace, ribbons and bows! 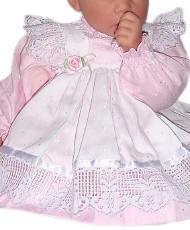 We have the cutest lace outfits, bonnets and baby gift sets all in the prettiest colors. 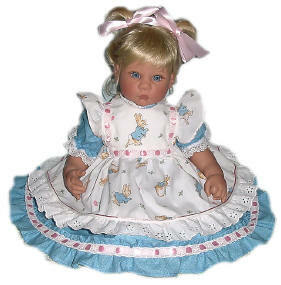 This baby doll dress is designed with a lot of lace and sunny yellow material with cute little polka dots on the dress. 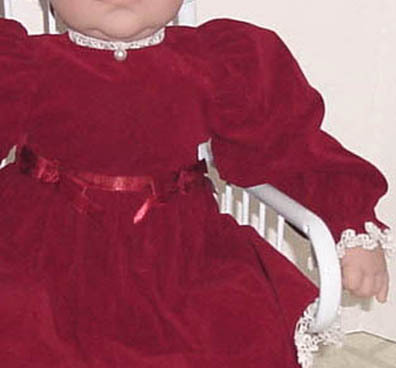 It has long sleeves and ruffles along the bottom of the dress. The neck and sleeves have tiny lace edging. Long matching pantaloons also adorned with lace edging make this an adorable set. Topping it off is a crisp white pinafore with a double row of lace over the shoulders and along the scalloped pinafore edge. The pinafore ties in the back. Along the front of the pinafore, there are 4 slim satin bows and a tiny yellow rosebud in the center of one bow. Included (but not shown in photo) are little matching booties with lace and rose on the ribbon. 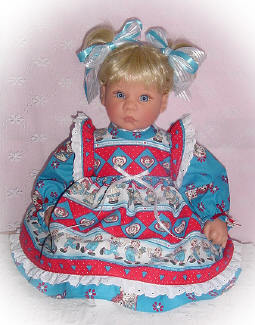 These baby doll dresses are made from a very pretty aqua fabric and embellished with ruffles and lace all around! It features a very full skirt and long puffed sleeves that are edged with tiny white lace. The back of the dress scallops up to show off the 3 layers of ruffled lace underneath. There is also a beautiful ruffled underskirt that is attached to the dress for extra fullness. Along the hem of the skirt there is a ruffled row of aqua adorned with white ruffled lace to match the lace on the edge of the ruffle. 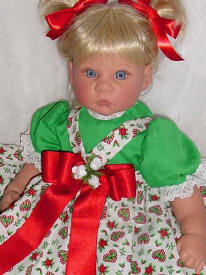 Matching headband is adorned with a ribbon rose and ties under the chin. 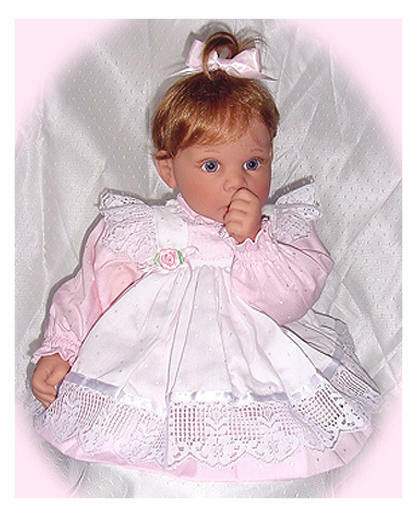 This is a really cute dress with plenty of lace and sparkles to brighten up your little baby doll. It will fit your 19-22" Lee Middleton or Berenguer dolls. The collar has a pretty scalloped edge and the tiny roses to embellish the dress. Around the hem there is a lace trim to add to the elegance and coordinate with the top of the neckline. Underneath it all are long cute bloomers. This is a long sleeve dress set so it's perfect for those LM babies who have don't have full vinyl arms. Hair Ribbons not included in this set but are easy to make. 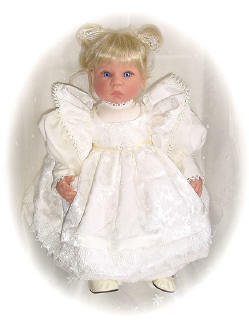 This is a beautiful crisp white batiste baby doll dress that shows "pure innocence." There is a gathered jabot of net and almost 3 inch wide Venice Lace around the edge. 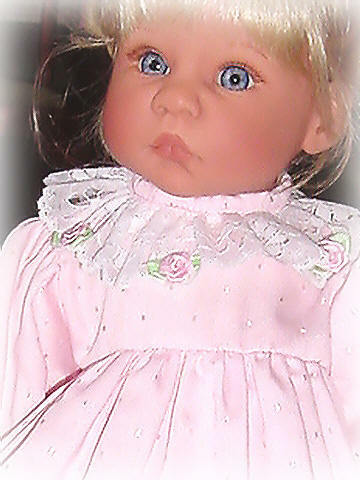 On the top edge of the neck, there is a tiny white satin ribbon with a bouquet of pink silk flowers and green leaves. This will fit your Lee Middleton 20-22" baby doll. Underneath it all are short batiste bloomers ruffled at the leg. Hair Bows not included. This is an exquisite pink batiste dress with an abundance of Bridal Venice Lace Trim. It would be perfect for your 19-22" doll. There is a gathered jabot of net and almost 3 inch wide Venice Lace around the edge. On the top edge of the neck, there is a pretty white ribbon rose with white satin ribbon streamers. Full puff sleeves have a wide cuff trimmed with matching Venice lace. The skirt is adorned with the same wide Venice lace and 2 rows of smaller Venice Lace with a white satin ribbon in between. There is also an attached slip underneath. Underneath it all are short bloomers ruffled at the leg. This is such a sweet set! Hair Ribbons not included. The Pinafore is very fancy with lace trim ruffles over the shoulder and around the hem of the pinafore. 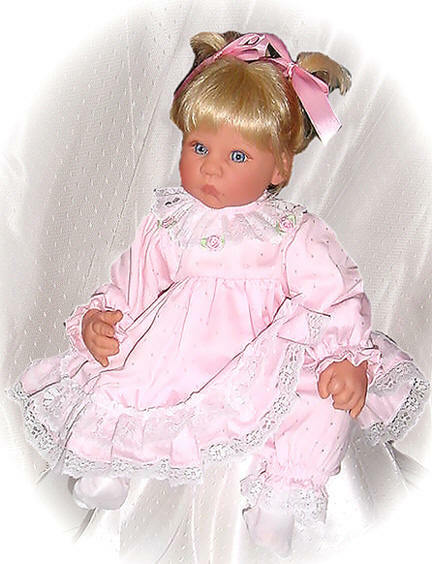 Two pink rosebuds with pink satin ribbon adorn the waist. The white fabric has the same sparkles in it as the pink fabric and looks so cute!! The pinafore buttons closed in the back. The dress has lace around the neck and soft ruffles at the wrist. It has long sleeves and zips up in the back. Matching short bloomers complete the set. 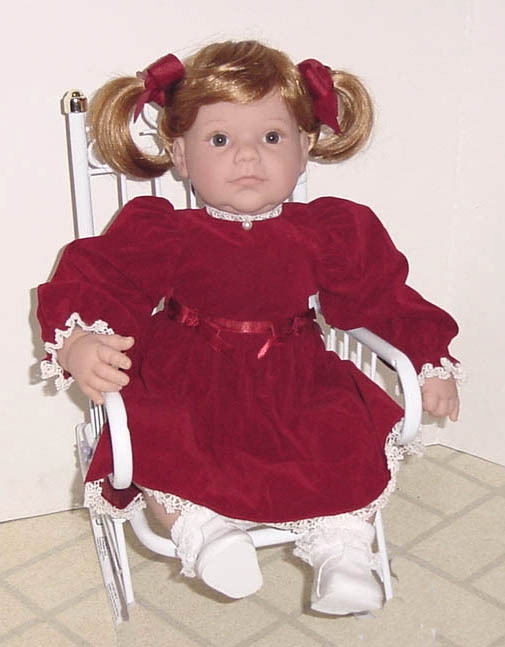 This Sweet Corduroy Outfit will fit your 20-22" Lee Middleton or Berenguer Reborn dolls of similar size. 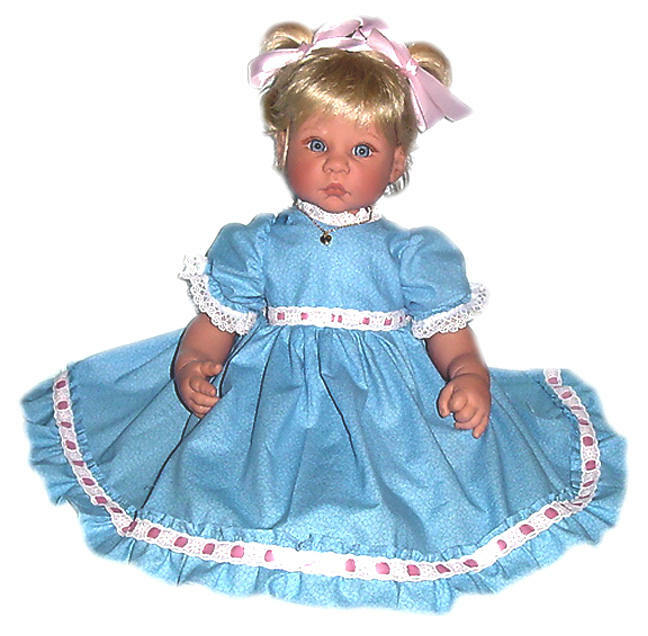 The outfit is made from Pink Pinwhale Corduroy and has long sleeves and pants, perfect for those dolls with only part vinyl arms and legs. The sleeves are ruffled at the wrist and adorned with tiny Venice lace trim. The same trim is also shown along the hem of the dress. 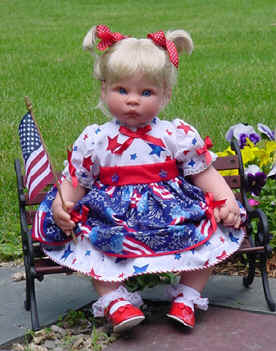 This is especially cute on the toddler dolls ! Across the bodice, there are flowers embroidered in pink with 3 ribbon bows as accents. A cute Matching Corduroy Bonnet that ties under the chin and has tiny Venice lace trim makes this set just adorable! Daisy Kingdom "Raggedy Ann & Andy"
This Dress was handmade by me from 2 different Daisy Kingdom fabrics. 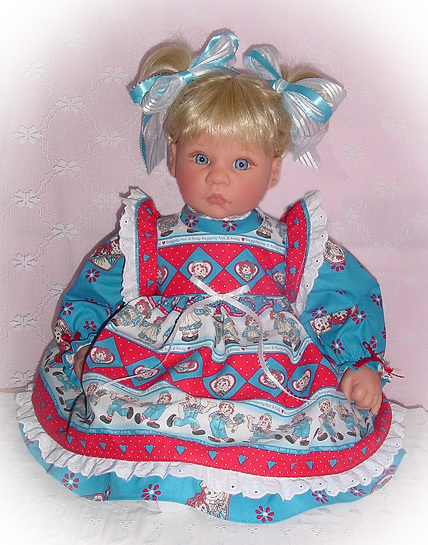 The dress is made from a daisy kingdom blue fabric with Raggedy Ann and Andy are pictured in a heart design with little red flowers decorating the rest of the dress. The pinafore is made from a pretty striped daisy kingdom fabric with different themes on it. The bottom of the pinafore has hearts bordering the fabric. Angel style sleeves puff out with eyelet trim edging. There is a little white bow on the front and matching eyelet trim on the hem of the pinafore. So cute!!! 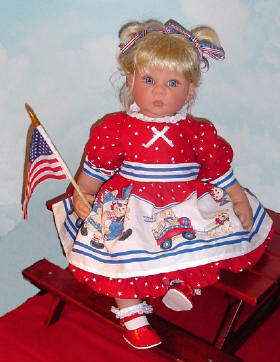 Cute eyelet trimmed Bloomers, an American Flag, and blue and white Hair Ribbons complete the set. Shoes not included. 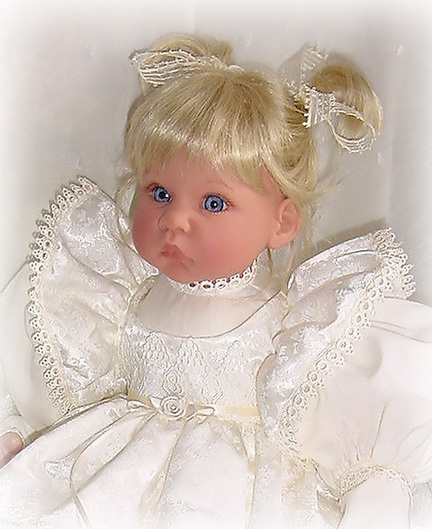 (Shoes Available at the bottom of this page) This will fit your 19-21" doll. 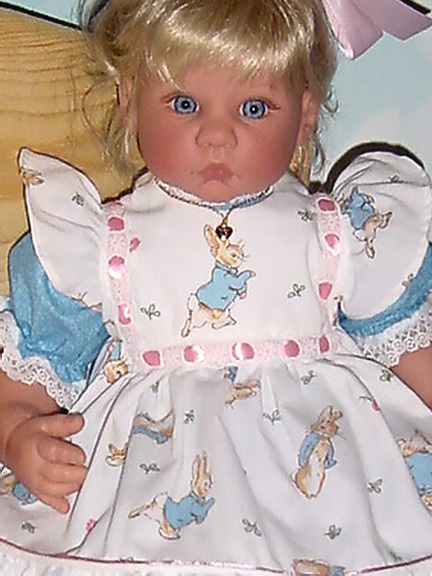 The adorable Beatrix Potter Pinafore was made to coordinate with the dress. On the front of the pinafore, there is a matching white eyelet lace trim with the same pink satin ribbon woven into it. 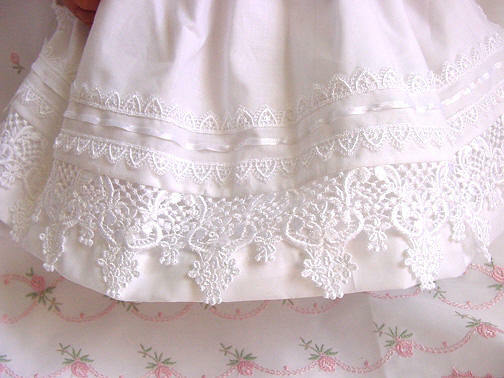 A White Eyelet Lace trim was added to the hem of the pinafore and cute shiny pink cording edges the top of the lace. Over the sleeves, I added ruffles made from the same fabric. Underneath it all there are lace trimmed bloomers to go with the dress set. 2 Pink Satin Ribbons are also included to put in your dolls hair. 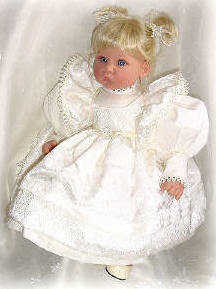 Just precious for your Lee Middleton Baby Doll or Toddler. Necklace not included. 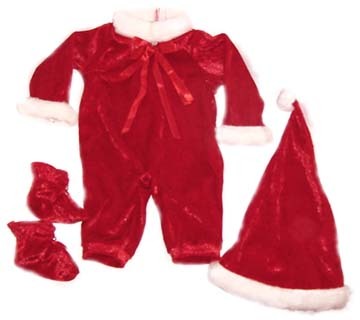 This is the cutest red Santa Suit for the 19-20" Lee Middleton Babies. 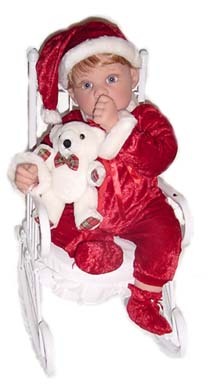 (Shown below on "Best Friend Bear" Doll) It includes a Red Soft Velour Santa Suit with White Faux Fur around the collar and cuffs and a Red Bow with a Bell. There are 2 Red Matching Booties that also have a Bow and Bell on them and the cutest little Santa Hat with Faux Fur at the Edge of the Hat and at the Tip of the Hat. Absolutely Adorable. This is just perfect for Christmas! 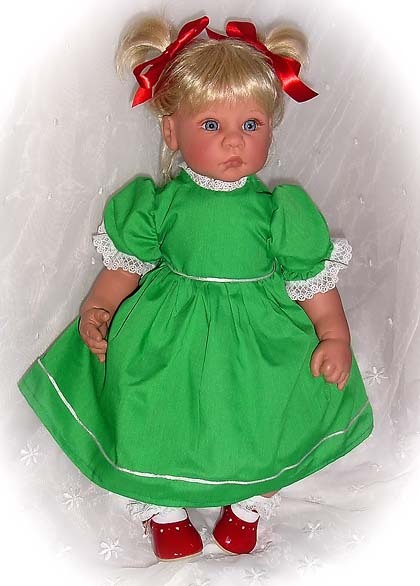 Adorable green dress with white piping around the hem and also at the waist. There is a delicate lace trim around the neck and sleeves and matches the cute short white bloomers underneath. The Pinafore has little Hearts as a decorative accent. There are two straps over the shoulder with a tie in the back. 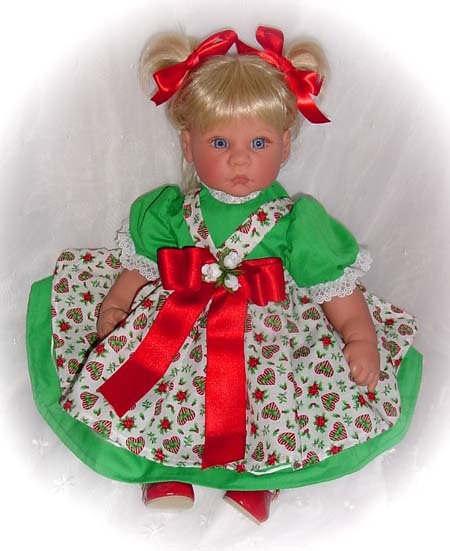 Adorned on the front of the pinafore is a beautiful Red Satin bow with 3 white roses in the center. 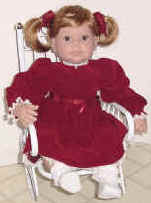 Matching red satin hair ribbons and white lacy socks with red Mary Jane shoes are also included. Fits 19-22" dolls. This is a "One and Only" dress set ! Don't miss it!